‘Non-native species’ are organisms that have been transported via human activities and introduced to locations in which they previously did not occur. Environmental conditions have allowed them to successfully establish populations and reproduce. 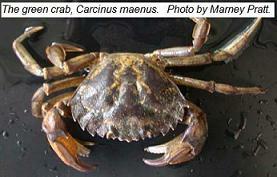 Examples in the Gulf of Maine include periwinkles and green crabs. When their presence and interactions with the new environment, habitat or species community are disruptive and have a negative impact, the introduction is termed ‘invasive’. Marine invasive species pose significant threats to Maine’s marine and estuarine ecosystems and species of commercial importance such as soft-shell clams. Maine’s most destructive and costly invader has been the green crab which arrived in the eastern U.S. in the mid-1800s via ballast water from vessels from Europe and significantly diminished the soft-shell clam resource. A more recent introduction, MSX (oyster disease) in 2010 in the Damariscotta River, threatens the center of Maine’s oyster aquaculture industry. Marine invasives are easily spread by ocean currents as well as by human activities such as shipping (ballast water) and transport by hull fouling on boats moving up and down the coast and across the seas. Our most effective means of dealing with marine invasive species is through prevention efforts, such as limiting importation and requiring inspections of imported species, fish health regulations, monitoring, and education. Maine DMR is keeping its eye on a number of marine invasive species that have been identified in recent years, including the green crab; Asian shore crab; Didemnum, a tunicate described as looking like pancake batter that spreads over the bottom and structures; and Codium, a spongy green algae that can completely cover and smother shellfish beds. Currently DMR staff participate in the Northeast Aquatic Nuisance Species Panel, the Maine Marine Invasives Working Group, and the Gulf of Maine Research Institute’s Vital Signs project. The MIT Sea Grant has conducted periodic surveys of invasive species at points along the Maine coast as part of a regional effort in the Northeast to identify and track the spread of marine invasive species. For more information, please contact Robert Russell. For more information about green crabs, please see the contact info on the green crab page.